Jeremy Corbyn is increasingly willing to challenge the government on Brexit, according to a BBC analysis of Prime Minister's Questions since the EU referendum. Since the turn of the year, two fifths of the Labour leader's questions have been about the United Kingdom's imminent departure from the European Union and Mr Corbyn now seems more determined to challenge the government consistently on this issue. In the last 10 PMQs, Corbyn has chosen to address Brexit with 42 out of a possible 60 questions - exactly 70% of the time. Of the 14 that weren't about Brexit, six were about buses and another eight were about the NHS, although two of these followed on from a line of questioning about Theresa May's promise to pour a supposed "Brexit dividend" back into healthcare. Of course, there are different ways of classifying his questions - a question can be about more than one subject - but by my reckoning this has made Brexit the most common theme of Mr Corbyn's questions since he became leader. Despite this, Mr Corbyn has been criticised in the past for skirting the issue, when he has the opportunity to put the government on the spot. In total, since the EU referendum on 23 June 2016, he has asked 105 questions about Brexit. That equates to just over 27% of all the questions he has asked in that time. But they haven't come in one steady stream. Between 25 January and 22 November 2017, Mr Corbyn only referred to Brexit in one question, and that - on 25 October - was to list the lack of no-deal planning alongside a number of other examples of alleged government incompetence. The prime minister had no trouble evading the issue in her response. 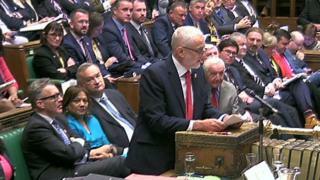 Mr Corbyn did respond to statements made to the House by the prime minister after key EU summits and after PMQs on 29 March 2017, the day Article 50 was triggered. But PMQs is an opportunity for the leader of the opposition to take the initiative and to drive the debate. Over those 10 months, he chose instead to speak about public sector pay cuts, the sweetheart deal for Surrey Council, Theresa May holding Donald Trump's hand, changes to National Insurance for the self-employed, zero hours contracts, universal credit, tax avoidance, school places, Grenfell Tower and the NHS. It was left to Emily Thornberry to probe the government on Brexit when she deputised for Mr Corbyn on 12 July 2017. The shadow foreign secretary grilled then deputy prime minister Damian Green with six straight questions about the government's no-deal planning. The picture has gradually changed since. As Labour has shifted towards a softer position on Brexit, Mr Corbyn has begun to ramp up the pressure in PMQs. There was a clutch of 12 questions at the end of 2017 and another dozen at the end of February, before he turned the heat up from May. Critics might complain about Mr Corbyn's execution, but they can no longer say that he is not talking about Brexit. All of which goes to prove the old adage: you wait for one Brexit question and then 42 come along all at once.